Love this look! the skirt and tights are wonderful! i love the peep-toe & tights combination! 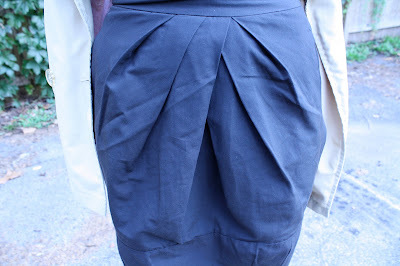 and i agree, tulip skirts are soo flattering! I love, love, love your tights. Such a nice and interesting color. I cannot wait to wear more tights once the weather calls for it! oh this is great outfit inspiration because the tights i got at weardrobe are that same color and i've been trying to figure out how to wear them! you look lovely! the blouse and skirt are so nice together! LOVE the tights. My fav thing about falling temps - tights in all sorts of fun colors! so cute! I am crushing on those tights, big time. 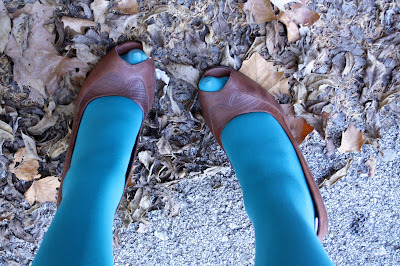 I only have three pairs of tights in my yet-to-be-obtained tights collection, and teal is my next choice. Excellent! I'm new to your blog, but I'm enjoying it very much, especially because you're putting together some truly adorable outfits without the increasingly familiar, anchoring presence of at least one item that screams "Money!" Props to you, Kansas, from Illinois! I have these same tights, they are such a cute color. this look is adorable! 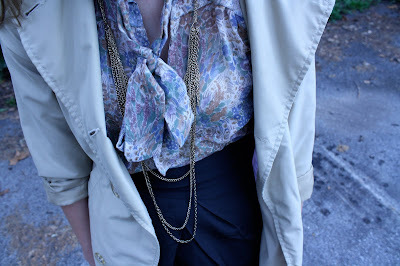 i love how feminine the blouse is. Super cute! I have been wanting to try colored tights or leggings but haven't had the courage yet, you inspire me!! I love the way that coat gives a freshness to your entire outfit. I'm loving the tights with that blouse as well. Just lovely! aw its just so so perfect! I adore the blue tights! !